The mere fact that I had never been to the Brooklyn Brewery was disturbing, and a long omission on my brewery/brewpub life list – sitting at 100 for several months. A long favorite, Brookyn has been turning out wonderful craft brews for 13 years — including the fabulous Brooklyn Black Chocolate Stout (still the best ever for a beer float with vanilla ice cream, though stands very well solo — of course). Taking the subway from Manhattan was blessedly simple, and I arrived on Bedford St. thirsty but early for the brewery tour. I was originally hoping to get in a visit to SixPoint (Righteous Rye is a new canned favorite), but their website informed that they were closed to visitors due to expansion. Expansion turned out to be the theme of the day. I knew of “Mugs Ale House” from their ads in Ale Street News, and was happy to slip into their cool interior to enjoy some local craft brews just 5 minutes from the Brooklyn Brewery. Scott the bartender was alone when I arrived, engrossed in viewing “Carlito’s Way”, but quickly (and thankfully) turned his attention to my needs as I settled in at the bar. I started out with Brooklyn’s “Concoction” which was flavored with ginger, honey, smoked malt and other exotic ingredients. As we talked about beers, new to me were brews from Wandering Star of Mass. and Crossroads of Athens NY, which flowed happily. 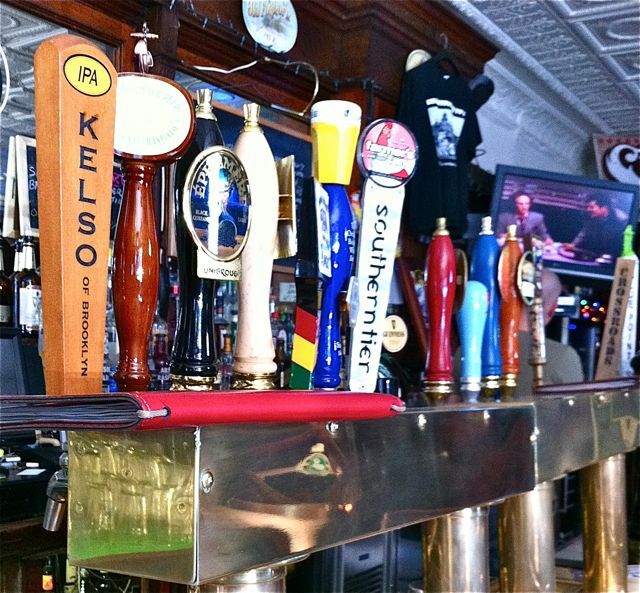 Scott shared with me that while business is still going great, he is a bit concerned about craft beer saturation – you can get fine craft beers in just about every restaurant now. He also told the sad story about how Southampton Publick House’s great “Double White” was an example of how the rapid expansion of some breweries were resulting in outsourcing/contracting and a dilution of the quality. He was, on the other hand, sanguine about Brooklyn’s expansion efforts because “Garrett is still very personally involved” (brewmaster and beer “rock star” Garrett Oliver). At the brewery, we started with a tasting with Jason – our tour guide, and met “Monster” the brewery’s mascot brew-cat. 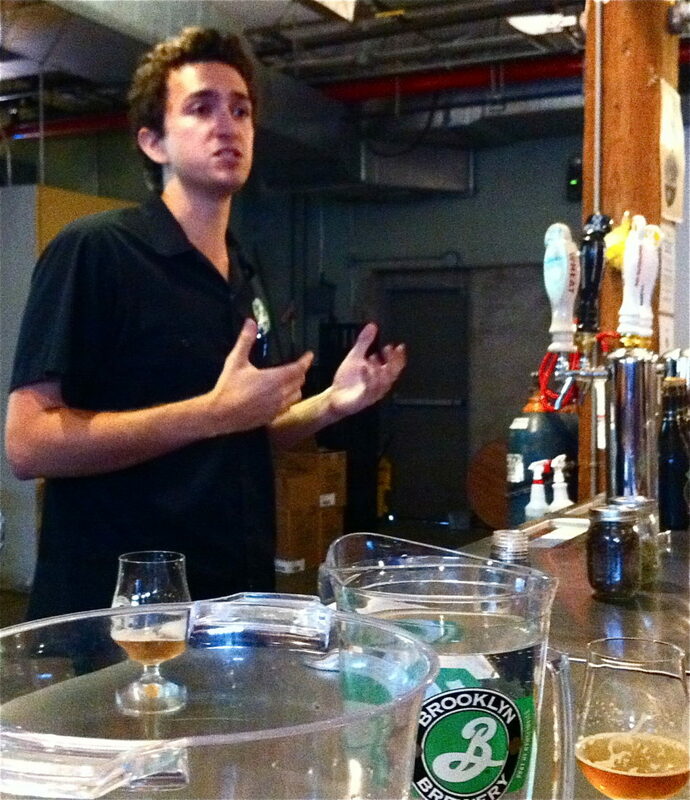 Jason did a great job dispensing beer, beer lore and the history and culture of Brooklyn Brewing. He packed more information into an hour than I do in a whole series of classes – not sure that the casual beer fan could possibly comprehend it all. He related a great story about Milton Glaser (the originator of the I love NY logo) designing the now famous Brooklyn “B” logo for stock in the fledgling company and “beer for the rest of his life”. Now over 90 years old, he is starting to make that deal look better and better – for him! Yes, Brooklyn is expanding, with six 200 bbl fermentors being installed in the adjacent warehouse to increase capacity almost ten fold. I thought about the comments from Scott from Mugs and the danger of uncontrolled growth, then saw Garret Oliver flash though the brewery checking on things. He was gone before I could ask him about it, as clearly he’s a busy man – about to get a lot busier. In the meantime, I’ll enjoy another glass of great Brooklyn beer, looking forward to more.